Searching for online information is in itself a learning process. You may test keywords, examine the relevance of results, and, when you find a result you like, you may try to find similar or related results. Google sometimes helps you with the process by providing “related” or “similar” options, but these options aren’t available for every search result. 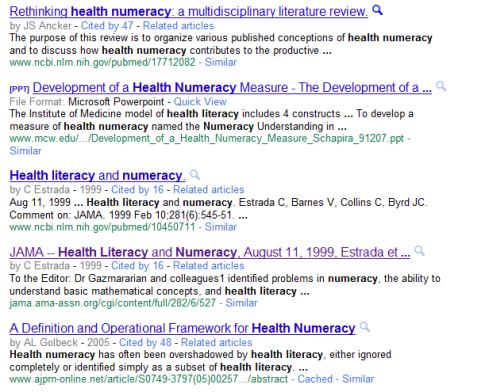 The illustration below illustrates the search results displayed when I enter the keywords “health,” “literacy,” and “numeracy” into the Google search field. Many other search engines don’t even provide this somewhat haphazard option. Thus, when you find relevant search results and want to find similar results, you may try to modify keywords based on the words you’ve found in an article that’s useful. Ambiently offers a different search path, allowing you to add a discovery engine to any search engine you use. Using this discovery engine, you can quickly find pages that are related to one you’ve identified as relevant in a search effort. Simply add the Ambiently bookmarklet to your browser to get started. (Don’t worry Internet Explorer users, for once, this a bookmarklet that can be used with IE.) You can perform your initial search using any search engine, including the Ambient search engine. In my initial test, I used Google. Once you find a Web page that looks promising, simply click on the bookmarklet and you’ll be directed to the Ambient page that displays related search results. You can browse the identified pages or focus your search further by performing additional jumps. In this way, you can quickly hone in on the most relevant search results. More information about how to use Ambiently can be found on their FAQ page. Ambiently gives you a quick way to focus your search results to find relevant web pages. It’s easy to use and can cut down on the number of steps you might take to refine a keyword search. Your initial search results will necessarily depend on which search engine you’ve used. 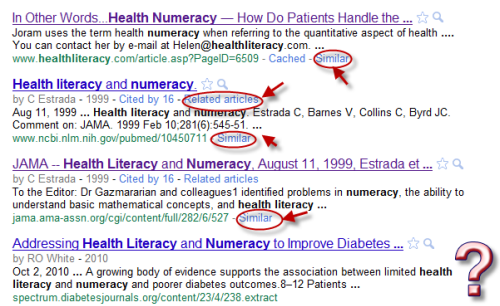 In this Search Engine Comparison you can see the differences in the search results you obtain when you use Google, Bing, Yahoo, Nexplore, Sortfix, Blekko, and the Ambiently search engine to find pages relevant to the keywords: “health,” “literacy,” and “numeracy.” However, once you find a search result, the Ambient page for that particular result will be the same regardless of the initial search engine you started in. How does an Ambient page compare to Google “similar” results? They’re quite different, as shown below, using the illustrated search result as an example. Which page is superior? 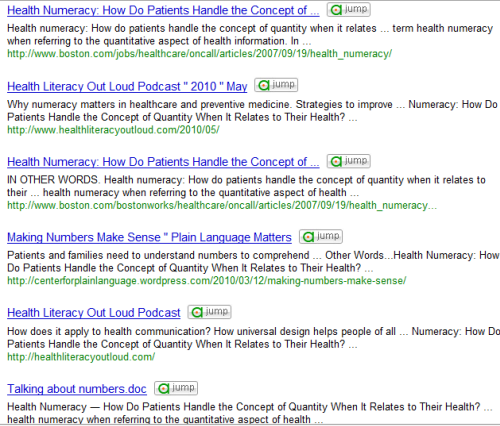 Neither, for my interests, since I found useful results on both pages. I think this just highlights a point I’ve made in other posts, which is that you should never rely on a single search tool if you are truly trying to get a broad perspective on a problem. To investigate some different search engines as you explore Ambiently, you can explore this Symbaloo webmix of search engines. This entry was posted in Ambiently, instructional design approaches, search engines and tagged Ambient page, Ambiently, Bing, blackberry approach, blekko, discovery engine, finding relevant pages, google, health literacy, health literacy numeracy, nexplore, search engine algorithms, search engines, Sortfix, Symballoo, Yahoo. Bookmark the permalink.